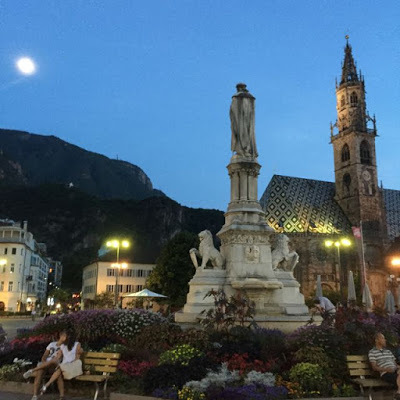 Bolzano turned out to be another gem of a place – just lovely. Our Hotel Scala was great and, hallelujah, had a pool – just what I needed to straighten out the body after a day in the saddle. So while Michael went off to the museum to check out ORTZI – the Ice Age Man, I spent a happy couple of hours chuckling to Bill Bryson’s Neither Here Nor There eating a stale croissant, that I found in the bottom of my pannier, with a cup of hotel room tea; Sunday means that you needn’t bother to feel hungry or thirsty in this hotel because everything was closed. We were really getting to love rocking up to all these towns we had never been to before and doing as much exploring as we could in the short space of time that we had available – it was a real adventure with the stress taken out; all the hotels were booked for us and the bags were transported every day and there was never a hitch in any of that. (UK company FreedomTreks). Beautiful Bolzano, with its lovely central square lined with grand buildings, is the largest city in the South Tyrol where, once again, you are in Italy, still but it feels very Austrian. For a large University town it was remarkably quiet – that Sunday thing again, and we were beginning to despair of finding anywhere decent to eat. That’s when we noticed a boutique hotel with a roof-top garden restaurant that was open and, although we were the only customers, the nice young man who served us couldn’t have been more helpful. So with a glass of prosecco in one hand and a forkful of very good lasagne in the other we suddenly felt that, at last, we had arrived in Italy. 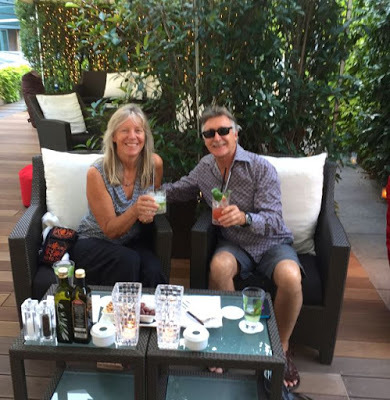 That was after the capriosca and insalata caprese and, with all thoughts of endless pedalling quickly fading we settled on our rooftop to watch the sun setting over Bolzano with full moon rising over the mountains. The next day we set off after breakfast destined for Trento on what was supposed to be a mammoth day of riding – 75 km, but we had already decided that this would be a little too much for us and took the train option for part of it – what a smart move! It meant that we could ride the scenic bits and avoid the not so pleasant parts that followed the autostrada – remember that this is the main route into Italy from the north, and the traffic on these large roads was horrendous. 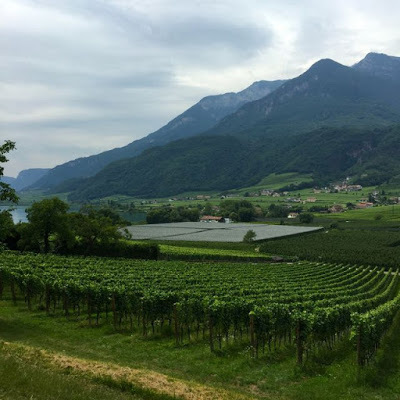 Our 40km of cycling today took us through mile after mile of luscious scenery; grapes ripening in vineyards; fertile river valleys edged with mountains, and lovely Lake Caldaro where we were very tempted to go for a swim. As we had cozzies, but no towels, we thought we would try our luck and cycled into the rather grand, but very Austrian, lakeside Park Hotel to enquire about hiring some towels and a bit of lunch. We were met by the frosty receptionist in the whole Heidi outfit – dirndl skirt, white blouse and black velvet waistcoat – she even had her hair in bunches and very rosy cheeks! She informed us that it was verboten to swim in the lake without first paying 45 euros each for a days’ ‘Wellness Ticket’ (about A$80 each). Well, we din’t feel at all well as we wearily pushed our bikes back up the driveway and onto the road again. The unfriendliness we had encountered over the past couple of days continued on the bike track and, to us, it was very strange. The lycra brigade would come hurtling past us, without ringing their bells, and just shout abuse at us. One chap even gave Michael a shove as he was going past – nearly knocking him flying. 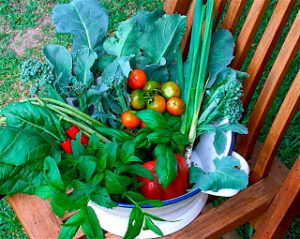 I asked my Mullumbimby Austrian friend about this the other day and he said that we were probably breaking some rule that we didn’t know about – written or unwritten – I suspect we were just going too slow!. Anyway, this all seemed to suddenly change as we headed towards Trento with more Italian cyclists coming the other way – people started to give us a friendly wave or a thumbs up – a couple even said ‘bravo’. I also noticed that the high wire fences we had seen around all the orchards and vineyards, had suddenly gone and an open rural landscape stretched out before us in all its glory. The last part was easy because we were on the train. The only difficulty was that the stations didn’t have lifts and we had to carry the bikes up and down several flights of stairs AND the bike carriage at the back of the train had a steep three stairs up to it – that’s when I tore a muscle in my shoulder trying to hurl the bike up. Don’t ask me why you would have a specific carriage for bikes on trains and not be able to access them easily – the automatic doors didn’t help either – the bruises lasted for months! 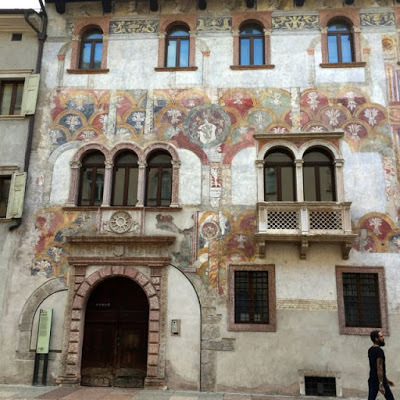 And then we arrived in Trento – what a gorgeous place!! 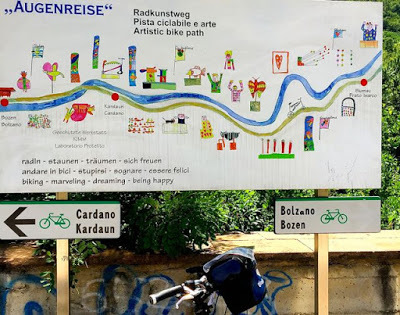 Anyway, there we were, finally wheeling our bikes from the train station through Piazza Dante, centred around the most marvellous statue to its namesake, on our way to the Grand Hotel Trento – and very grand it was – we thought we were in the wrong place. After a quick wash in our marble bathroom we were ready to explore yet another new place and, I can tell you, we were in for a treat. 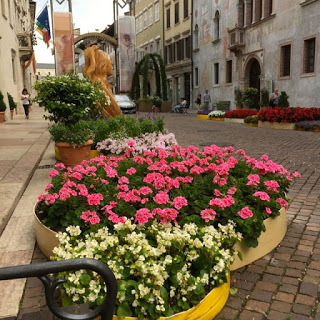 Trento is stunning – a feast for your eyes: cobbled streets, lace ironwork balconies, frescoed villas, shuttered windows, and then the Piazza del Duomo – the cathedral square, which was surrounded by wonderful buildings and a fantastic baroque fountain of Neptune playing in the centre. Standing on the steps of the cathedral, as I looked around, the mountaintops of the Dolomites formed a backdrop visible above the rooftops in every direction – just breathtaking. To top it off, an arts festival was in full swing and the streets were full of flowers and public art. 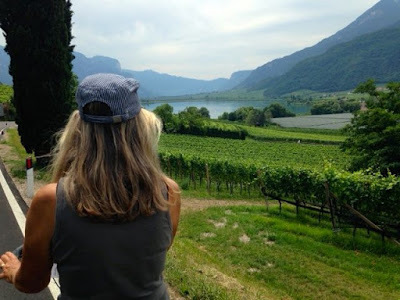 NOTE: Our daughter, Francesca, subsequently told me that on her first European travels, twenty years previously, that Trento had been her favourite place and that she and her partner had tried to get work and stay there. 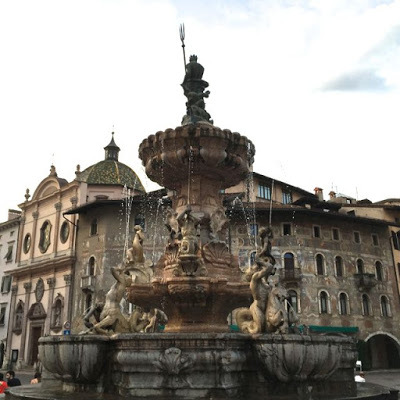 Dotted around the Piazza were very enticing looking eateries – just deciding which one caused a bit of a marital hiccup, but we (I) settled on Scrigno del Duomo (the bread looked good and the waiters were cute) – and we were both very glad we did because we had a most memorable meal. 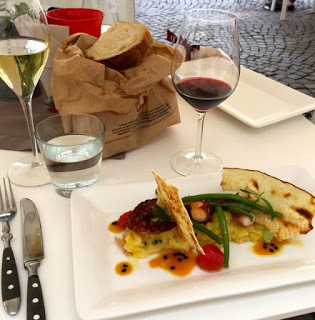 Trento is in the heart of prosecco country so we started off with the waiter’s recommendation and a delicious roasted octopus salad on a potato and tarragon salad with a passionfruit sauce – sounds weird, but it worked. This was followed by for me by a homemade fettuccine with a veal ragout and Michael had a very good pea and prawn risotto – the bread was very good too. We wandered back to our grand hotel and thankfully slept like logs because tomorrow was going to be a real test – Lake Garda or bust! NOTE: Cleaners throw out art installation because they think it’s rubbish. This happened at the Bolzano Museum just after we were there. An artist had set up a room depicting the excesses of the 1980’s – a room after a very wild party; full of bottles, glasses, overflowing ashtrays, streamers, balloons – except they forgot to tell the cleaners and they binned the whole lot. I would love to have been a fly on the wall and wonder what they would have thought of Tracy Emin’s unmade bed?